Microwaves and mini-fridges free Wi-Fi and a seasonal pool make Days Inn Columbia NE Fort Jackson a good value. 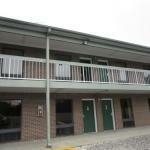 Two-story Days Inn's 44 rooms each feature free Wi-Fi satellite/cable TV and local/long distance phone calls. All are equipped with a microwave mini-fridge coffeemaker alarm clock iron hairdryer and work desk. The seasonal outdoor pool is a great way to cool off after a day in the South Carolina sunshine. Parking is free. Days Inn is off Exit 71 on I-20 a 10-minute drive from downtown Columbia and the University of South Carolina. There are several restaurants nearby with additional dining options available at Columbia Mall two miles away. Fort Jackson is 23 miles away. Columbia Metro Airport is 15 minutes away.